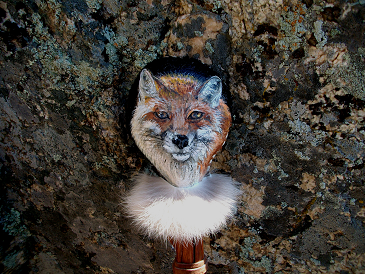 By the artist "Moon Cat", the Red Fox Rattle embodies the energy and medicine of the Red Fox. 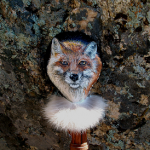 The Red Fox is a shape shifter; she camouflages with her environment and she is very observant. She is able to change direction at the blink of an eye. When we work with Red Fox Medicine she teaches us her magic; her abilities to observe, blend in and change directions quickly. She also teaches us the value of being soft, sensual and beautiful. This Rattle is made from rawhide and contains organic corn, selenite and clear quartz crystal within it. There is also leather and rabbit fur on the handle.